UNITED NATIONS, Feb. 19 (Xinhua) -- The Food and Agriculture Organization (FAO) on Friday, for the first time, lauded bees for their role in helping increase crop yields. The small insects, wild or honey ones, have been unknowingly fertilizing plants as they move tirelessly from flower to flower. In doing so, bees may have a key role to play in improving the production of some two billion smallholder farmers worldwide and ensuring the food security and nutrition of the world's growing population, the UN agency said in a new study published in Science magazine. "What do cucumbers, mustard, almonds and alfalfa have in common?" asked FAO in a press release. 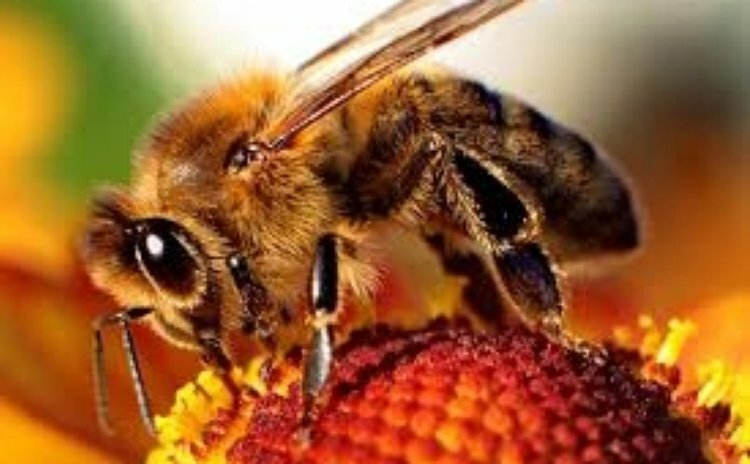 "On the surface, very little; but there is one thing they share: they all owe their existence to the service of bees." "This holds promise for one of the major agricultural challenges of our time -- how to help smallholders produce more without hurting the environment," UN spokesman Stephane Dujarric said at a daily news briefing here. "The research looks at how to attract bees and comes at a time when wild bees are threatened by a multitude of factors, including climate change." For centuries, this tiny striped helper has labored the world's fields without winning much recognition for its many contributions to food production, FAO noted. Wild bees, in particular, seemed doomed to slog in the shadow of their more popular cousin -- the honeybee -- whose day job of producing golden nectar has been far more visible and celebrated. But FAO said bees of all stripes are finally getting their moment in the sun. The report makes the case that ecological intensification -- or boosting farm outputs by tapping the power of natural processes -- is one of the sustainable pathways toward greater food supplies. Food security strategies worldwide could therefore benefit from including pollination as integral component, said the report authors. "Our research shows that improving pollinator density and diversity -- in other words, making sure that more and more different types of bees and insects are coming to your plants -- has direct impact on crop yields," said Barbara Gemmill-Herren, one of the FAO authors of the report. "And that's good for the environment and for food security," she said, adding that it is beneficial to actively preserve and build habitats in and around farms for bees, birds and insects to live year-round. When comparing high-performing and low-performing farms of less than two hectares, the outcomes suggest that poorly performing farms could increase their yields by a median of 24 percent by attracting more pollinators to their land. The research also looked at larger plots and concluded that, while those fields also benefited from more pollinator visits, the impact on yields was less significant than in the smaller plots -- probably because many bees have a harder time servicing large fields, far from their nesting habitat. But a diversity of bees, each with different flight capacities, can make the difference. The research comes at a time when wild bees are threatened by a multitude of factors and managed bee populations can't keep up with the increasing number of plots that grow pollination-dependent crops. Climate change poses yet another problem. "Bees will struggle with the higher temperatures," explained Nadine Azzu, the global project coordinator in FAO's Plant Production and Protection Division who also worked on the report. "Plus, flowers in some parts of the world are now opening at different times than they used to, and the bees are not there to pollinate," she said. Pollinators -- such as bees, birds and various types of insects that fly, hop or crawl from one flower to another -- have for centuries been the invisible helpers of farmers worldwide. Different types of bees have distinct tastes and roles to play in the food system. Bumble bees, for example, are one of the few types of bees that can successfully pollinate tomatoes, which heavily rely on buzz pollination to bear fruit. Honey bees, in turn, are important because they are the least picky in their choice of flowers and there are many of them, in each hive, even though their more discerning wild bee cousins are more effective in fertilizing the plants they're attracted to. The study found that for smallholdings, crop yield increased linearly with increased visits to the flowers that were being tracked. Pollination was the agricultural input that contributed the greatest to yields, beyond other management practices. The report also found that attracting pollinators to farms is not as easy as planting for the season and waiting for them to arrive. Keeping flowering hedge rows around the farm, and mulch on the ground that bees can hide under, are additional recommended tactics to attract them, as is reducing the use of pesticides. The key to getting the best yields probably lies in a mix of managed pollination services -- that is, installing bee hives in plots at flowering time -- and wild pollination, said the author, adding that the latter will require farmers and policy makers to take a closer look at the ecosystems that surround farms. "The take away from our study is that bees provide a real service and should be taken into account when we plan food security interventions," said Azzu. "And the best part is: their service is free."